The Feral Turtle: Dandruff Shampoo Bars. 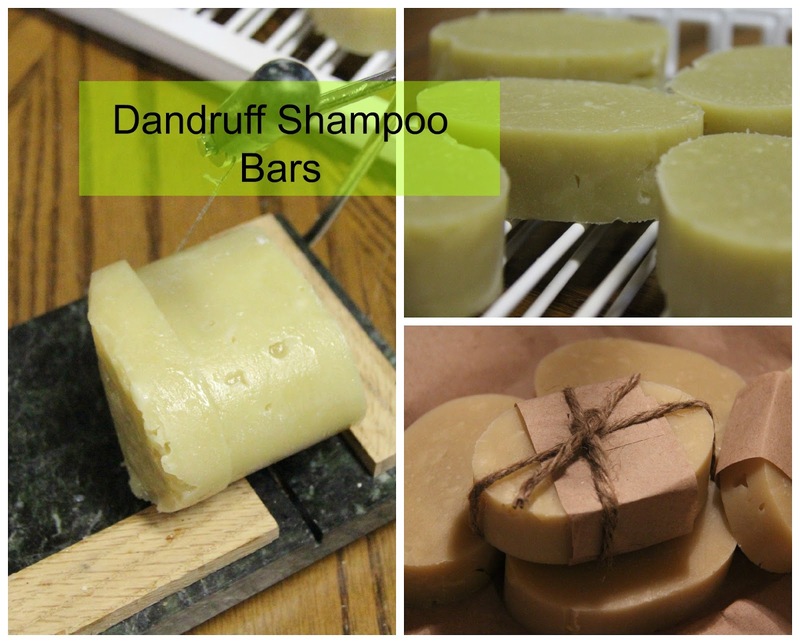 It's time for a new batch of shampoo soap bars! I decided to make this batch for those people infected with the Zombie Dandruff! It's similar to the Zombie Virus but Zombie Dandruff affects only the scalp. Now don't get me wrong, many people just have dry scalps and normally we shed this away.....no biggie, but for the undead with a nasty dandruff disposition, we're keeping our fingers crossed! I researched which oils would be best and came up with this recipe. them how good it is, they'll believe you. Try it! Plus, I am a natural "BS"er... What can I say, it's a gift! But this is no BS! I always encourage safe soap making practices. Wear your safety gear people! The thyme tea water is made by steeping a handful of fresh thyme in about 8 ounces of boiling water. Let cool in the refrigerator. Using a large stainless steel pot, melt all the oils, butters and waxes. Cool to 110 degrees. 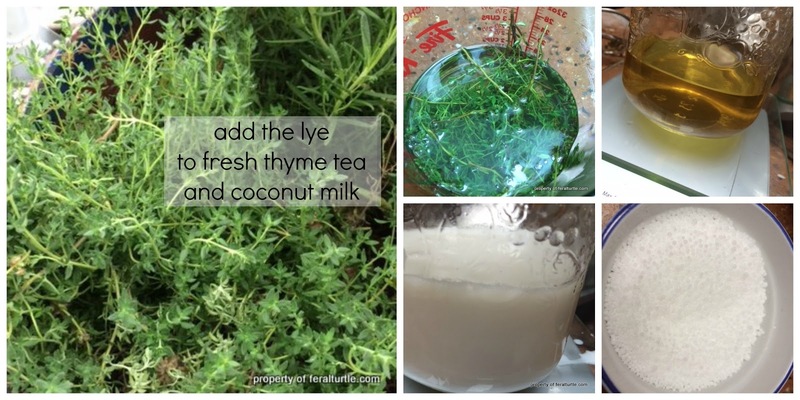 Meanwhile mix your thyme water with the coconut milk in a 1 litre glass canning jar. Place your jar in a sink and pour in the lye. Put cold water in the sink surrounding the glass jar. This helps cool the mixture more quickly. I use a wooden skewer to mix the lye water wearing my rubber gloves. Cool to 110 degrees. When both are at 110 degrees, pour lye mixture into oil mixture. Stir oil and liquid together with a silicone spatula or a wooden spoon. 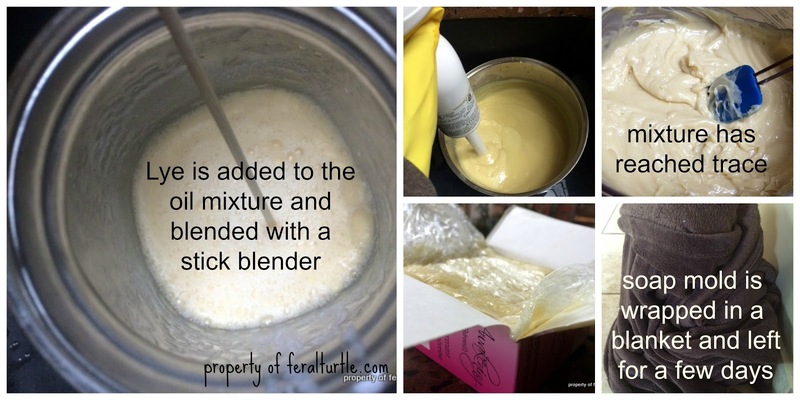 Now use your stick mixer and blend until the soap reaches trace. Poor in your essential oils and blend until thoroughly mixed. Pour your mixture into soap molds and wrap in a blanket. This needs to sit for a few days to a week, until it is fairly hard. Cut into bars and let air dry for a week on wire racks. This helps the air get to all the surfaces. or you can go to these past recipes and see my method! REMEMBER TO ALWAYS ADD YOUR LYE TO THE LIQUID! I do this in a glass canning jar in my sink in case of any spills or accidents. Always wear rubber gloves, long sleeves, and eye protection. An old cheese cutter modified to cut soap quickly and evenly. Also it makes your cheese taste clean, or it makes your soap smell cheesy. And here they are...the finished soap bars! Ta Da!!!! A quick PH test tells me they are safe to use. I aim for my soap to be a seven which is neutral. You can add lemon juice to your conditioning rinse which helps soften your hair. Look who popped by for a visit....and you thought I was over this obsession. I will let you know how my guinea pigs fair! Actually this won't be tested on any guinea pigs! I only test on family and friends! Beautiful soap and I bet it smells wonderful! You've given me the idea to try a Thyme rinse. Having baby fine hair and all that oil? I don't think it would do more than give me greasy dandruff, but the Thyme rinse........hey, it can't hurt. Laughing over here! I love how you have no scientific proof this will work, but you're willing to bs it. And I love cheesy soap...nothing better than smelling like cheese after you've bathed. Do you know that soap making is on my list but the lye has me scared stupid. They look great let me know what the gp's say. Okay, I am bowing to your "pioneer spirit" to be making your own soap! What great gifts, as long as you don't stress the "dandruff" thing -- that might make someone self-conscious! You really do have a weird obsession with those beaded spiders! I guess maybe we have too many of the real creepy crawlies here in AZ -- I would be cringing whether they are real or not! You are full of surprises! I didn't know you made soap. They're so pretty! Do you give them as gifts? Hint Hint. Love that you make your own soap. I buy homemade soaps often, and I bring them home as souvenirs when we travel, but I'm scared silly of making them myself. I'm with Mel... the lye scares me. Pinning for the day I get over my fear of making my own soaps and bars. And SQUEE! You put skeleton heads on the spiders this time. I LOVE them! So much more spookier for Halloween! Making my own soaps in on my list and I'm gaining confidence to do it by following your posts. Between the combination of herbs and oils in your soap, I can only imagine how wonderful it smells. I think the gp's are going to love it! Beaded spider topped home made soaps?? Now that would be a very cool gift to receive! I love your tip on lemon juice to soften your hair, also. (I have such dry hair). Pinning!! I won't make soap because I don't even make brownies, but I admire yours (and naturally I love the skeletor spider!) I go to craft fairs and buy soap other people have made, mostly Patchouli and herb scents, to place in my home for whiffs of wonderfulness. Wow! I had no idea what the process was for making homemade soap until I found you! I will continue to seek out people like you to purchase mine. It's a lot more work than I imagined. 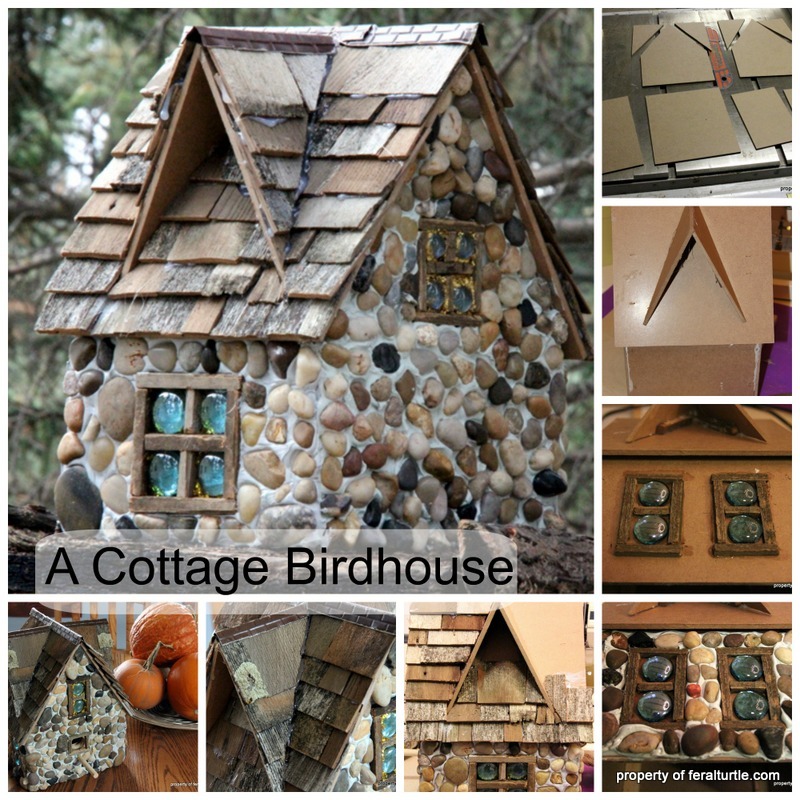 I love the tied twine. Very pretty. So you have a family of guinea pigs? They must smell evenly: I love all the essential oils you used... I've never mixed them with cheese, tough (even if I'm French). I bet this smells wonderful! I'm so glad to know you are practicing safe soap making and thanks for the tip on how to make my cheese taste clean. You are so funny and I'm glad you're still making spiders. LOVE that skeleton head! You are one freaking patient turtle. And I'm glad your spider obsession is returning. I now have to go stroke #6.